For feedback you can find us on Twitter @IANewOrders or on the FFG Forums for Imperial Assault. In this episode we have some initial reactions to the skirmish deployment cards from Heart of the Empire. We start with Imperial cards, then move to Mercenary cards, and finally discuss Rebel cards. I say Vader with Driven by Hatred is 12 points but he’s actually 13 ( 18 point base -5 on the attachment). I was talking about using a command card I called Tools for the Job with Han but actually meant Smuggled Supplies. We totally read J4X-7 wrong: it give pierce to enemy figures it’s adjacent to. Will mention in next episode. Thanks for listening and we’ll be back soon to talk about the new Command Cards! We sat down with Imperial Assault Designer Jonathan Ying for a quick chat at SHUX. He talks to us about the origins of Imperial Assault and the skirmish mode. He also tells some other fun & interesting stories about IA development. Jonathan’s new game is called Bargain Quest. It’s up for preorder now after a successful after a very successful Kickstarter campaign. We greatly enjoyed playing it and are looking forward to our own copy. Thanks for checking out our short break from our usual skirmish analysis. We’ll be back with Heart of the Empire discussion soon. 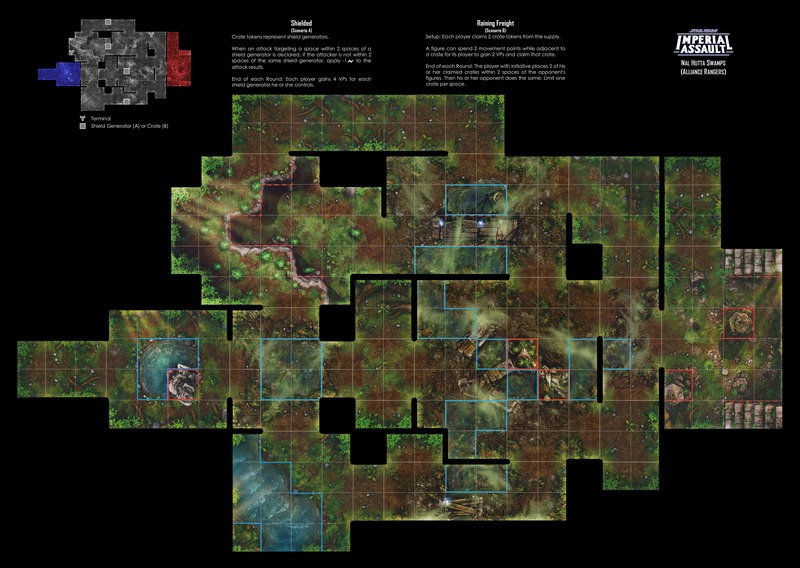 In this episode we discuss the most recent map added to tournament rotation: Nal Hutta Swamps (link to detailed map preview). 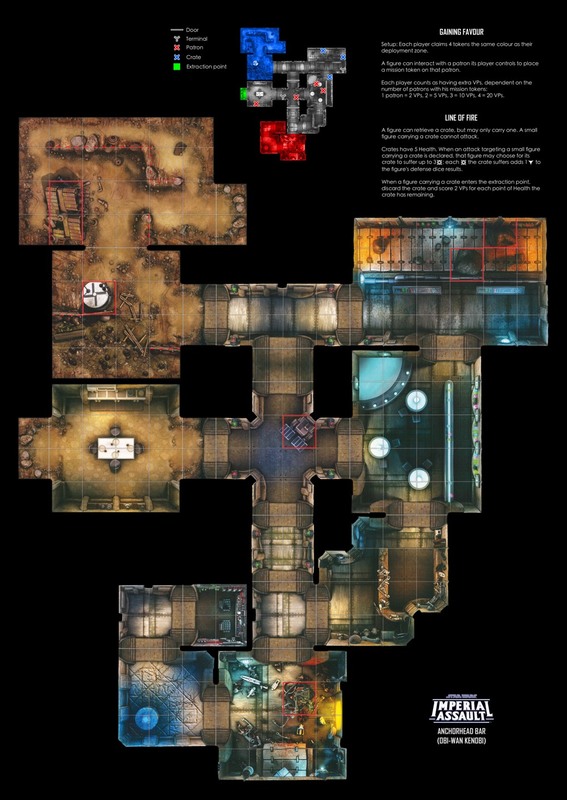 Please also check out the Imperial Assault Skirmish Map Project for map reference as well as creating printable play-mats of all 42 skirmish maps. In this mini episode we discuss the Imperial Assault Skirmish Map Project and Network Neutrality. Impressions and strategy on the Jabba’s Palace map. Review of the Deployment Cards in the Droid-Themed Reinforcement Wave: including Hera, Chopper, 0-0-0, BT-1, Jawas, and IG-88’s Skirmish Upgrade. Quick review & thoughts from a recent Store Championship tournament. A discussion of some cards we got wrong from the Jabba’s Realm wave. All the Command Cards from the Jabba’s Realm wave. Please follow along in the command card discussion with visuals from Boardwars.eu: Jabba’s Realm Box, Rangers, Terro, Jabba, and Luke. Feedback welcome on Twitter or FFG Forums. More to come soon & thanks for listening. We discuss our experience at the Northern California Regionals. Also some excitement (but no spoilers) for Rogue One! Nick also posts frequently on the FFG Forums as ‘nickv2002’ here’s the New Orders thread. In this episode we discuss the new ISB Headquarters map. We also talk about the upcoming World Championship for Imperial Assault, specifically covering the metagame, lists we would play, and general tournament advice.